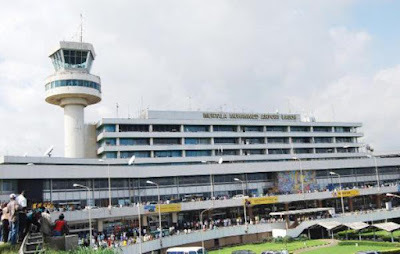 There was pandemonium-drama at the Murtala Mohammed International Airport yesterday as an official of the National Drug Law Enforcement Agency (NDLEA) was stabbed by a Nigeria Air Force (NAF) officer during a disagreement. According to reports, the officers engaged in a heated argument over when they should close for the day. The officers who work at the Hajj and Cargo Terminal international wing of the airport reportedly agreed to close by 7pm for some security reasons. At about 5pm, the Nigeria Air Force officer went against their agreement and asked everyone to leave the terminal. The NDLEA asked him to wait till 7pm as they had all agreed. This led to a heated argument which degenerated into a Physical fight. As the officers fought, it is alleged that another Air Force officer stepped in to defend his colleague and he stabbed the NDLEA official. The injured NDLEA officer who was bleeding profusely was rushed to the hospital. Confirming the incident, NDLEA spokesperson, Mitchell Ofoyeju, said it was a minor incident that had been resolved by both agency.